SYDNEY, Australia, February 6, 2014 (ENS) – A species of beaked whale that was previously misnamed has been correctly identified as a new species, based on the study of seven whales stranded on remote tropical islands in the Indian and Pacific Oceans over the past 50 years. With the re-discovery of Mesoplodon hotaula, there are now 22 recognized species of beaked whales, a widespread but little-known family of toothed whales distantly related to sperm whales. These deep diving whales live in ocean waters beyond the edge of the continental shelf throughout the world’s oceans. “They are rarely seen at sea due to their elusive habits, long dive capacity and apparent low abundance for some species. Understandably, most people have never heard of them,” says Dr. Merel Dalebout, a visiting research fellow at University of New South Wales, who led the international research team that correctly identified the new whale species. The researchers used a combination of DNA analysis and physical characteristics to identify the new species from seven specimens found stranded in Sri Lanka, the Maldives, the Seychelles, the Gilbert Islands (now Kiribati), and Palmyra Atoll, located halfway between Hawaii and American Samoa. But two years later, other researchers reclassified this specimen as an existing species, Mesoplodon ginkgodens, named for the tusk-like teeth of the adult males that are shaped like the leaves of a ginkgo tree. The specimens on which identification of the new species is based are held by the Smithsonian National Museum in Washington DC, the Island Conservation Society in the Seychelles, and the University of Auckland, New Zealand. The genetic analyses were conducted as part of an international collaboration with the Southwest Fisheries Science Center of the U.S. National Marine Fisheries Service and Oregon State University. The researchers were able to get good quality DNA from tissue samples from only one specimen. For the others, they drilled the bones of the whales in order to analyze short fragments of “ancient DNA,” relying on techniques used with old sub-fossil material from extinct species. 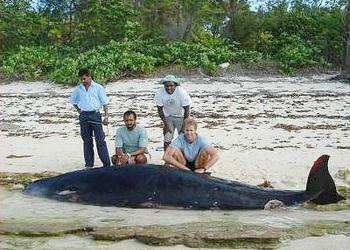 The researchers studied all other known beaked whale species to confirm the distinctiveness of Deraniyagala’s whale, including six specimens of the closely related, gingko-toothed beaked whale. “A number of species in this group are known from only a handful of animals, and we are still finding new ones, so the situation with Deraniyagala’s whale is not that unusual,” Dr. Dalebout said. Over the last 10 years, two other new beaked whales have come to light – both through research in which Dr. Dalebout was involved. In 2002, Mesoplodon perrini or Perrin’s beaked whale, was described from the eastern North Pacific, and in 2003, Mesoplodon traversii, the spade-toothed whale, was described from the Southern Ocean. Both species are known from just five animals each.